Soundproof glass can be a great asset for a variety of situations. If you live in an area with a very dense population, have a lot of noise coming from nearby traffic, or want to keep office interior spaces private, the idea of sealing off that sound with a new set of windows or doors is really appealing. Unfortunately, “soundproof” is a bit of a misnomer. While the name suggests glass that completely eliminates sound, it’s more accurate to say that it reduces sound by an increasingly noticeable margin. How does soundproof glass work? Technically, there are two different answers. Part of what makes glass soundproof is the actual construction of the glass, which we’ll get into a bit later. The effect that different construction has, however, is the reduction of certain frequencies. Sound can be a bit complicated. We’re capable of hearing a wide range of frequencies, but generally we’re only concerned with certain ranges that we are consistently exposed to. Soundproof glass, and most construction materials, are given an STC (sound transmission class) Rating, which is a numerical representation of any given partition’s ability to reduce sound. Standard single pane glass is around a 27, while dual pane glass can range from 26-32 on average. For reference, at a rating of around 25, it’s relatively easy to hear normal speech and standard noises. For soundproof glass, the various means of construction result in an STC rating between 38-50, significantly reducing noise penetration. Different types of soundproof glass can offer different qualities, which largely depends on the style and manufacturer. While some may specialize in eliminating certain frequencies found in an office environment, others might produce windows designed to minimize the noise of a busy street. By comparison, the STC Rating refers to the general ability of the window to reduce noise overall. Soundproofing is the result of a number of methods, from insulation to specialized construction, the idea is to capture and mitigate vibrations before they can fully penetrate the partition. That principle also applies to the process of constructing soundproof glass. Thick glass, which is exactly what it sounds like. By increasing the amount of mass sound needs to penetrate, the sound is reduced by a relative factor. Air gaps, which introduces layers of air between glass panels to deaden the sound. Laminated or Acoustic glass, which is some variation of a glass-plastic-glass layering construction. While each style has its merits, laminated and acoustic glass are the most efficient options with the highest STC ratings. Laminated and Acoustic glass are similar in construction and effect, often differing in the particular resin used between each layer of glass and proprietary construction techniques. Acoustic glass is, in a sense, a variation on laminated glass that uses a specialized acoustic variation of the PVB (polyvinyl butyral) that appears in most laminates. In addition to the soundproofing quality, PVE and EVA (ethylene-vinyl acetate) interlayers frequently block a majority of ultraviolet radiation. If you’re looking to reduce noise in a room or apartment without the expense and installation of brand new, soundproof glass, there are plenty of alternatives. Many doors have air gaps between the bottom of the door and the jamb or around the edges. One of the ways to reduce noise pollution is weatherproofing the door with rubber or foam that covers the gap without impeding the door. They also produce specialty, cloth wall panels and heavy soundproof curtains to hang around your home. These curtains and wall panels help to reduce the noise that bounces off hard surfaces around your home, reducing the overall sound. Additionally, the extra thickness over windows, thin walls, and other surfaces helps eliminate excess sound penetration. If you bring together a few of these techniques, you can experience a much quieter home or apartment without the need for costly renovations. If you’re looking for steel doors and windows that help eliminate other unwanted environmental intrusions, contact us now! 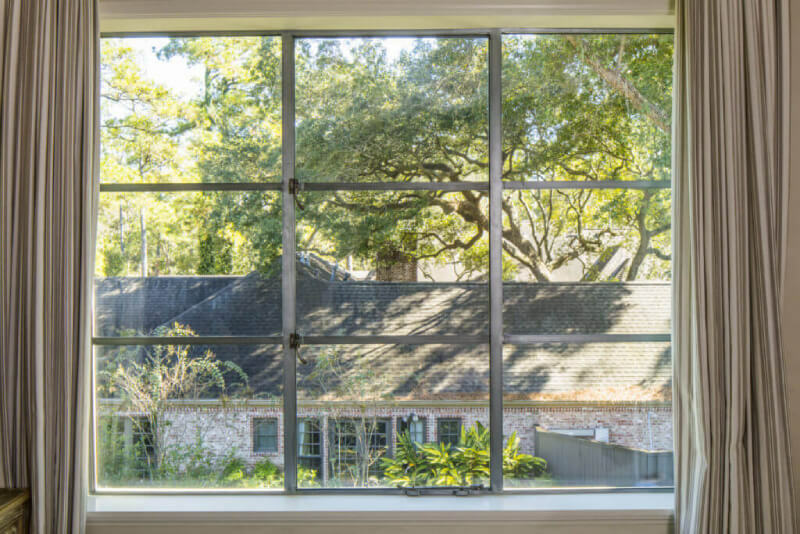 Home » Custom Steel Doors and Windows Blog » Custom Steel Windows » Is Glass Soundproof?